Video means business. We heard from the INBOUND stage how video is becoming the king of content. The importance of video has been a consistent message from the stage at INBOUND. The launch of HubSpot Video powered by Vidyard is an inflexion point. Tyler Lessard from Vidyard declared that Video means business. You are not too late to start. Video is still emerging and predicted to be the majority of internet traffic within the next few years. There are still some key opportunities. I have adopted adding video to my email signature. “Savvy marketers need to gear up now for establishing their video content strategy and video ad strategy. Now is the time to capitalize on the epic video trend. Facebook is heavily focused on a video first approach for the platform,’ writes Mari Smith. Video was the buzz topic at INBOUND18, with many keynote and breakout sessions; almost an entire stream. The biggest announcement was the launch of HubSpot Video powered by Vidyard. These bring the full GoVideo integration to all HubSpot Professional and Enterprise customers. This IMPACT Bnd post describes what this means in detail and contains the Hubcast podcast interview with Tyler Lessard. This video below with Dave McLeod is the one recorded, edited, optimized and published during the INBOUND18 session titled Video content curation in 20-minutes for the aspiring content marketer. The video is good enough quality; the lighting is good enough; the audio quality is good enough too. It was created on an iPhone, without an external microphone, MacBook, iMovie and uploaded to YouTube. Other presenters recommend Camtasia for the non-Mac users. In this full DemandGen podcast, host David Lewis and Tyler Lessard reinforce our INBOUND18 message about using the iPhone to create an authentic video. It was a real delight and fun to be a speaker at INBOUND. You can view the slides and video created from my session Video content curation in 20-minutes for the aspiring content marketer. Despite the tech challenges we did complete a live demo as planned and are delighted by the blog posts, Tweets and direct messages discussing the session. Here is one by Insynth reviewing our session. Thank you, HubSpot for the opportunity to be a speaker. Next, I will be the expert on the Digital Trades School module on video marketing. We will be using the About Us page video challenge as a case study project with the students. 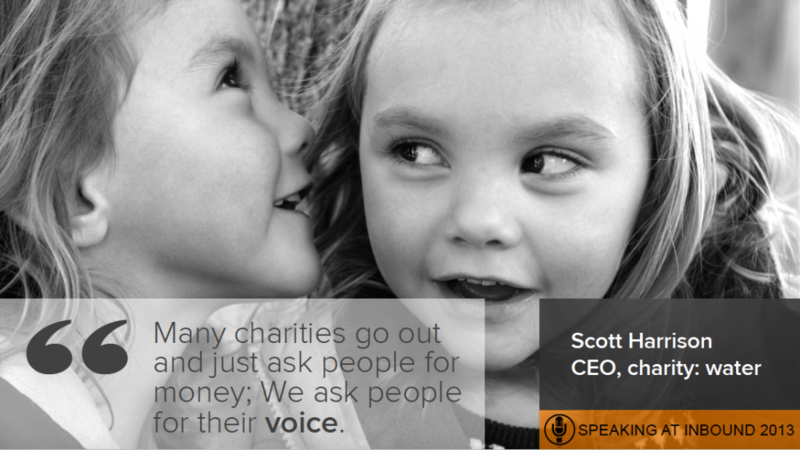 Scott Harrison, founder of charity: water pulled at everyone’s heart with his emotive keynote address. It was among the most widely commented moments on Twitter at INBOUND18. Rightly so. We were delighted to have published a Charity Spotlight feature about charity: water a couple of years ago. We have continued to follow their work and share the podcasts that have interviewed Scott Harrison. I am very much looking forward to reading his book Thirst: A Story of Redemption, Compassion, and a Mission to Bring Clean Water to the World. We will review it here in a future post. Co-founder of HubSpot, Dharmesh Shah continues to be one of the most entertaining keynote speakers at INBOUND. He is a self-confessed introvert, yet keeps an audience of 24,000 hanging on his every word. Watch his 2018 keynote here. We have always been immensely impressed by how HubSpot leads by example in so many respects. This comes down to company culture. It was good to hear Shah describe the Culture Code at HubSpot. Read the blog post How the Flywheel killed HubSpot’s Funnel presented by Brian Halligan in his keynote. VP of Product, Christopher O’Donnell also announced Email Marketing. This means that HubSpot Starter customers will now be able to manage their email campaigns from within HubSpot rather than exclusively via external applications such as MailChimp. This is significant, and we will be fully exploring to understand how it works and the limitations. “Marketing should be part of the business process, not what you do at the end to launch a product,” said Beth Comstock. Beyond the book Thirst noted above, we have been absorbed reading The Insider’s Guide to Social Media Video Marketing produced by Wave.video. It is informative and very timely. We understand that a digital version will be available shortly. I love that at conferences such as INBOUND the nuggets that you take away can often by tangential and unexpected. I like Antoine Dupont’s suggestion of Answer the Public, the free visual keyword research tool as well as to use video in email to guide a client through a proposal document. So smart. I will add Sharethrough Headline Analyzer to my bookmarks and must use tools. Check these out. We have already bought our tickets for INBOUND19. We will also be submitting again as a speaker to develop further the examples of cutting-edge video marketing techniques to build a brand. After all, video means business. ← What does your About Us page say about your brand?